Remarketing is a great tool that allows businesses and marketers to display their advertisements to the visitors who have already visited their website, given them their email address and used their mobile applications. Remarketing also offers a lower cost per click and a high conversion rate , which are both beneficial. 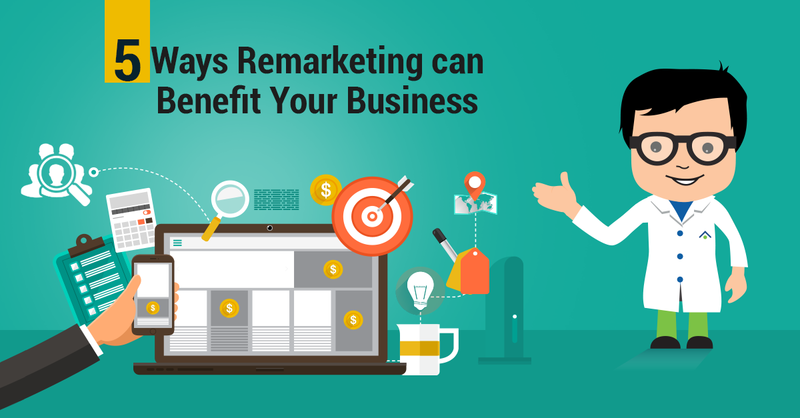 There are many ways in which Remarketing can benefit your Business. Let’s go through 5 proven ways that remarketing will make your business successful. The most important benefit of Remarketing is increased conversions.The main goal with online advertising is getting an interaction out of the end user . Someone who has already spent the time to know about your service or product is a step ahead of those that are only visiting on your page for the first time. These visitors who return back are more likely to convert than a new visitor. Remarketing allows you to meet different audience and also who are already interested in your business’s products or services. Creating great advertisements, can boost your sales. Remarketing is an essential tool that can be used to connect with people who are interested in your business’s products or services. While some people retain reservations about remarketing because it involves carefully targeting ads, tracking consumers and limited number of times they show to the same person, they actually offer value to the consumers. Remarketing allows you to earn customer loyalty, and see who is actually buying your products and services, and how many times your consumers view all your products before buying them. Remarketing allows you to target your existing customers as well as anyone showing interest in your products, so you can use the data to know what your customers are looking for and how interested they are to buy from you again. Relevance has always been the currency of the advertisements network. Showing more relevant and original ads can improve your conversion rate, click through rate and the total quality of your ad campaign. More importantly, a well designed remarketing campaign can provide lots of value to your business. Relevant advertisements can appeal the target audience, and also provide them with a pleasing user experience. Remarketing is also one of the best way to increase your brand’s exposure with pictures that might be more appealing to your customers. Your client become more familiar with your brand, when they are exposed to it multiple times. In turn, they are more interested to buy from you when they are ready to make their purchase. Because your audience is exposed to your brand, they will always remember you the next time when they are looking for similar products or services. These are the ways Remarketing can benefit your Business. Remarketing can also make it a best choice for all Business across the web especially when it comes to marketing campaigns. You can get in touch with us to know more about Remarketing.